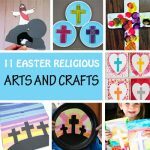 If you want to go beyond the store bought dye kit and not leave your little one out of the decorating fun, here are 25 creative yet easy ways for kids to decorate Easter eggs this year. I must say I was impressed to discover so many awesome decorating methods, from stickers to crayons and tissue paper to pom poms. All the methods listed below are doable by young kids. Some of the eggs were decorated even by babies. I think the hardest part would be to pick your favorite decorating way. I personally love them all. Save this list for later. Create cheerful polka dot Easter eggs with the help of round dot labels in bright neon colors. 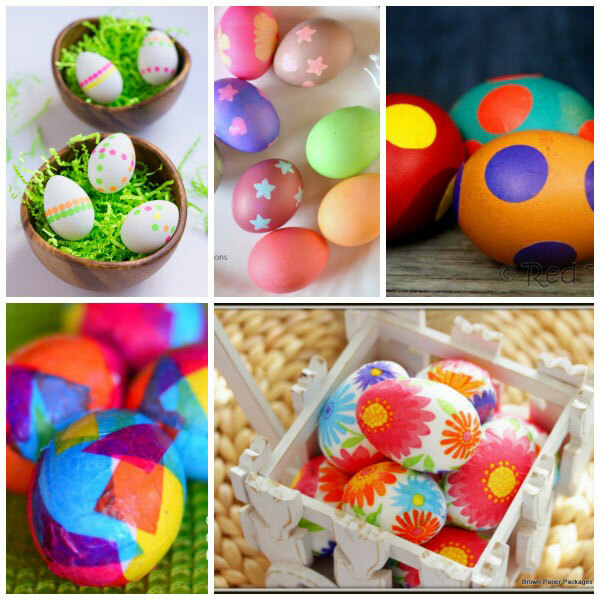 Use any type of small stickers: stars, hearts or flowers to decorate the Easter eggs before dyeing them. Find the tutorial here. Another way to decorate with stickers is to dye them first and then put on stickers. These spotty eggs are perfect for toddlers and make sure to use large round stickers that can be easily peeled off and stuck on by little hands. Tissue paper is a fun crafting material. Why not use it to make Modge Podge Easter eggs? Replace tissue paper with cutouts from spring napkins (floral, bird or sea life design) and you’ll get some beautiful decoupaged eggs. 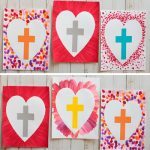 My oldest loves to draw so I know we’ll have to give these melted crayon Easter eggs a try this year. The only downside of this technique is that the drawing has to be done while the eggs are still hot. Be careful if you’re decorating eggs with young kids. We have decorated with crayon shavings in the past and the eggs turned out great. Use one color or several for each egg. See full instructions here. Sometimes pom poms is all you need to decorate Easter eggs. Use mini pom poms in pastel colors or neon pom poms to create adorable pom pom Easter eggs. 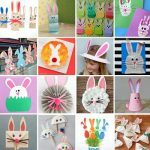 Grab your washi tape, cut it in a zig zag pattern or any other way you want and wrap it around the eggs to make beautiful washi tape Easter eggs. We all love confetti, right? It’s colorful, joyful, festive. Why not use a bag of confetti to make confetti Easter eggs? The gorgeous Easter eggs at the top of the collage are created by a baby. She used acrylic paint. I would recommend non-toxic natural paint. The volcano eggs are the result of a science experiment – my boys’ favorite science experiment : baking soda and vinegar volcanoes. The scratch and glitter eggs use a very interesting decorating technique. I’ve seen this technique used before to create the Northern lights on a canvas but it never occurred to me that it would also work on eggs. Got a hot glue gun? If so, use it to make beautiful hot glue Easter eggs. For young kids make sure to get an ultra low temp glue gun and low temp glue sticks. Another technique with similar results is to draw with a white crayon on the eggs before dyeing them. Find the tutorial here. 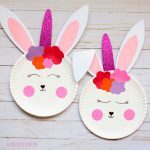 The glitter polka dot eggs are made with the help of a Silhouette but there is really no need for one when you can use double-sided adhesive dots. 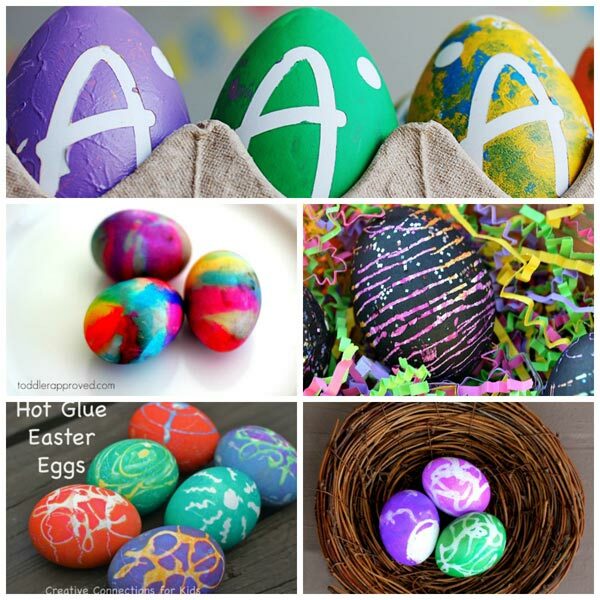 The tutorial for the Sharpie tie dye Easter eggs comes with several useful tips. Don’t forget to check them out. 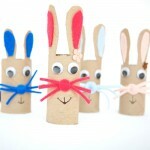 Decorate the eggs with cute fingerprints and turn them into carrots, bunnies, chicks or anything else you can think of. I heard many people using the shaving cream dyeing method but I haven’t get a chance to use it yet. I love the result, though. Beautiful shaving cream dyed Easter eggs. 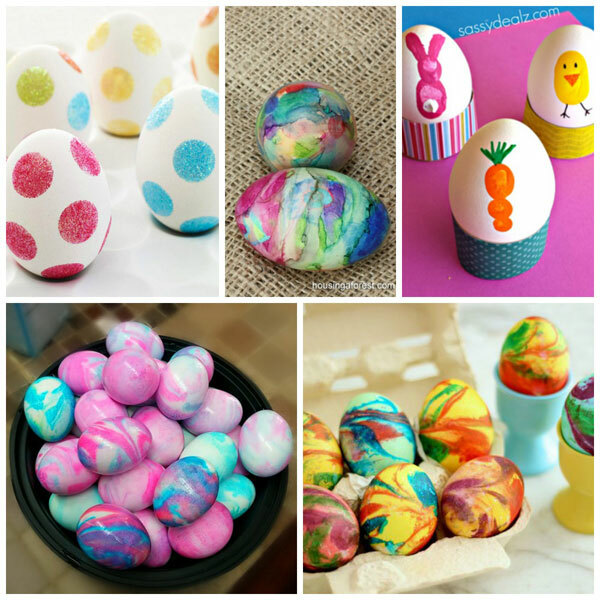 Put a spin to the shaving cream dyeing method to create the swirled Easter eggs. Who would have thought that such a simple thing as rubber bands can make a wonderful design on Easter eggs? 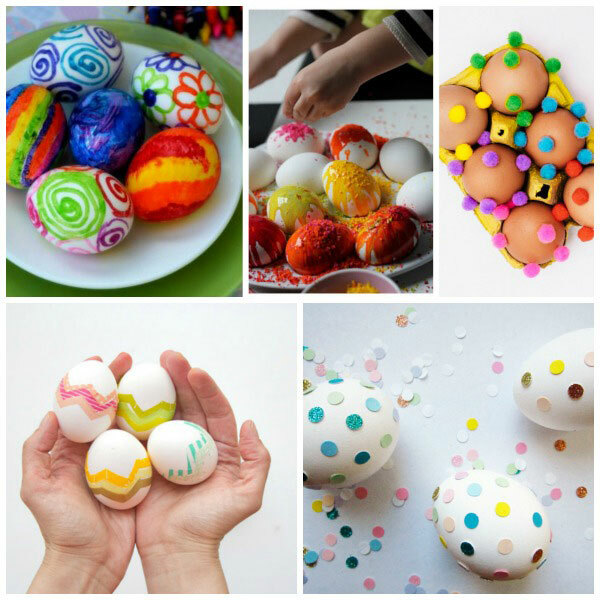 These rubber bands eggs are easy and fun to make. 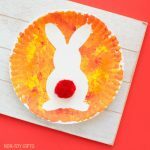 The glitter Easter eggs are made as decoration but this method would work very well on real eggs too. 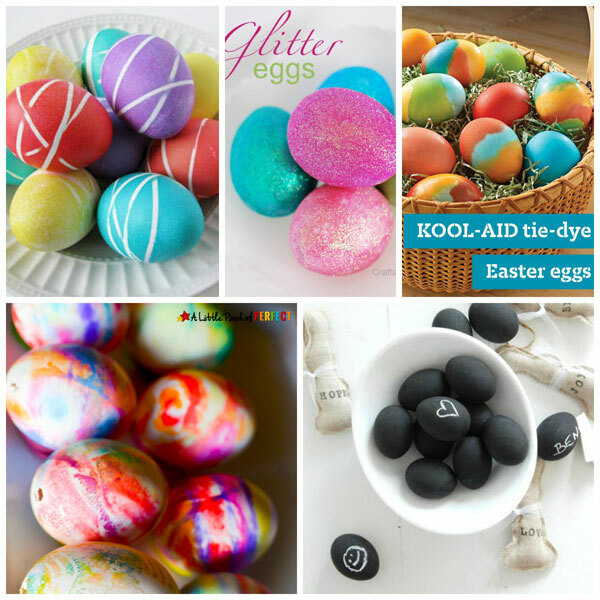 Have you ever tried KOOL-AID tie-dye eggs? If not, now is your chance. 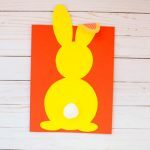 A no mess Easter egg decorating method that is perfect for any age, from babies to adults. Use non-toxic markers and non-toxic baby wipes. 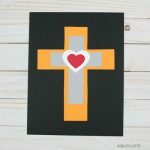 Make chalk paint Easter eggs with non-toxic chalk paint and let your little one get creative with non-toxic chalk markers.